Design your workspace to move with your day with our 360 Furniture WellFit monitor arms! Whether used in the office or at your POS station, these Wellfit Monitor arms will reduce eye, neck, and back strains, increase productivity, and make for a healthier workplace! Whether you have one, two, or three monitors, Wellfit has the arms for the job! Each screen mount holds monitors from 15” to 27” wide, and can handle weights over 17 pounds! Wellfit monitor arms feature a 360 degree rotation option and allow you to tilt the screen from -90 to 85 degrees! Along with these properties, each mount individually rotates to display your screens in either landscape or portrait style. The gas springs on these monitor arms not only make it easy to adjust your monitor, but will keep it in place once you find the right position. You can mount these monitor arms in two different ways: you can either use the pre-drilled holes with the included grommet mount to fasten directly to the desk, or, if you don’t have holes available, you can mount them with the included clamp onto desks up to 2” thick! Attaching the screen is easy, too! Line up the four holes to the back of your computer, and then tighten the screws. The 360 Office Furniture WellFit monitor arms offer the perfect solution for your workplace! Reduce eye, neck, and back strains, and increase productivity with our 360 Furniture Wellfit monitor arms! These monitor arms can hold 15" - 27" monitors, and can tilt your screens from -90 to 85 degrees! Easy to adjust, yet stable in your preferred position, these monitor arms are perfect for any workplace - watch this video for more information! 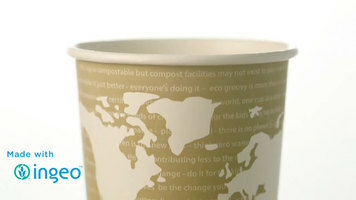 Eco Products offers a line of World Art hot cups that are both environmentally friendly and stylish. They come in six sizes to meet your needs and are color coded for simple size identification. 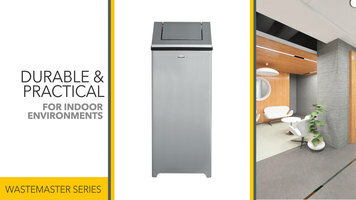 With a large variety of options available, the Rubbermaid Decorative Refuse Wastemaster series is ideal for indoor establishments. Check out this video to learn more about what this line has to offer! 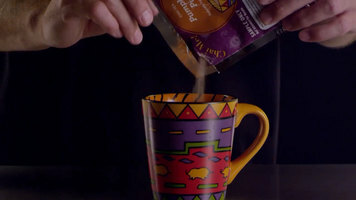 Serve customers a beautifully rounded, pumpkin chai flavored drink with this Big Train pumpkin pie chai mix! This seasonal delight is sure to be a favorite among your guests.